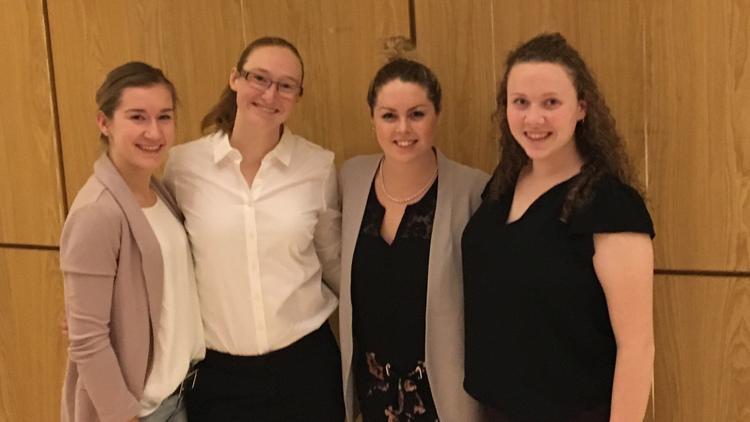 Four StFX Rankin School of Nursing students had the opportunity to represent StFX, gain insights into different areas of nursing, and have their voices heard when they attended the National Assembly of the Canadian Nursing Students Association (CNSA) held Jan. 22-26, 2019 in Calgary, AB. Of the four students, three attended as award winners. In attendance from StFX were fourth year student Maridith Brown, Official Delegate, StFX chapter, and Community Involvement Award winner; Emma Morin, a third year student and Associate Delegate, StFX chapter; fourth year student and Debate Team winner Valeri Molnar; and third year student and Travel Award winner Therese McCurdy. Ms. Brown says it was a tremendous experience, and one it’s vital that StFX be a part of. “I cannot emphasize enough the importance of StFX nursing students having a vote on the National Assembly of the CNSA. There are much bigger systemic issues being handled at the national level that students might not be aware of on a day-to-day basis here at X. We are one of 58 chapter schools across Canada and our voices speak loud. The impact of these collaborative efforts is much greater than any one school could have on its own,” says Ms. Brown. Ms. Brown says CNSA is for students by students, and that its objectives are to be the primary resource for nursing students, to influence and advance curriculum, and to strengthen linkages. CNSA has a number of stakeholders that nursing students are familiar with, she says, including Canadian Federation of Nurses Unions, Canadian Association of Schools of Nursing, and Canadian Indigenous Nurses Association, to name a few. She says along with the governance changes made at the national conference, much education was shared during the event, from informative speaker sessions to a nursing specialty speed dating event where students learned about unique specialty areas. “StFX's involvement in the CNSA is solely student run, so we cycle in the Official and Associate Delegates,” she says. Ms. Brown says she applied to be a delegate in her second year, and spent a semester as Associate Delegate before taking over as Official Delegate when the fourth years phased out. She encourages second year nursing students consider becoming involved. Ms. Brown says she and Associate Delegate Ms. Morin were proud to have two award winners from StFX along with them in Calgary. Ms. Molnar was a Debate Team winner, and Ms. McCurdy won the Travel Award. Both had to write essays to win the awards. Additionally, Ms. Molnar was required to debate in front of conference attendees. The topic, kept secret until arriving in Calgary, was that health care funds should be controlled by health care providers. “This was a heated debate and Val did an excellent job of defending her side,” says Ms. Brown, who received the CNSA's Community Involvement Scholarship. “The great thing about CNSA is that these awards are available to all members of chapter schools. I would urge any nursing student to apply for CNSA awards as there are increasing numbers of awards annually,” she says. Ms. Brown says regional conferences also happen across Canada and offer the same great benefits. In the Atlantic region, L'Université de Moncton will host in fall 2019.